Aesthetic or Cosmetic Dentistry is a term that is generally used to refer to any dental work that improves the appearance of a person’s teeth, gums and smile. It primarily focuses on improvement dental aesthetics in color, position, shape, size, alignment and overall smile appearance. There are primarily three dental specialties that predominantly focus on dental aesthetics.They are Prosthodontics, Orthodontics and Periododontics. Teeth whitening (bleaching): It is a fast and simple procedure which is fairly harmless on the tooth structure.The bleaching gel is applied on teeth, releasing oxygen.The final result is teeth with a brighter color. It is a safe procedure when taken place under the supervision of the dentist. Closing gaps: Teeth diastemas are very common. If a diastema remains after the eruption of adult teeth, it will become permanent and can only be corrected with the dentist’s help. Orthodontics would be the treatment of choice. Although, the use of veneers or dental bonding is a less expensive solution. Correction of crowded teeth: Treatment options include orthodontics, recontouring or reshaping of teeth, veneers, bonding and crowns. The use of resins or porcelain for posterior white fillings: To restore the natural color and appearance of the posterior teeth with cavities or amalgam fillings, the dentist can use fillings made of composite resin or porcelain ( inlays or onlays). The use of bonding and veneers: Dental bonding is a procedure in which a tooth-colored resin material is applied and cured (hardened) with a special light, which ultimately “bonds” the material to the tooth.The final result looks and functions like the original tooth. Bonding is typically used for cosmetic purposes to restore and improve the appearance of a person’s smile. Porcelain veneers are thin pieces of porcelain used to recreate the natural look of teeth.They are a very successful option in cases where the tooth has poor color, shape and contours. It is also a good choice for fractured teeth and gaps between teeth. The use of porcelain crowns or bridges with no metal for better aesthetics: Metal-free alternatives such as IPS e.max and Zirconia (ZrO2) ceramic substrates are gaining popularity for crown and bridgework. They offer superior aesthetics, as well as strength. 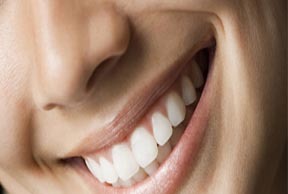 A brighter smile with natural appearance can make you feel more attractive and improve your self confidence.